This just in: the root of the publishing crisis, according to TheOutline.com, is…capitalism! Never mind that BuzzFeed is still running on VC investment and makes no profit at all. Not “not enough” profit. No profit. But whatever. How dare those parasites reduce the amount of cash they are setting fire to every month?! Who do they think they are?! Yes, that is correct. Clickbait comes primarily from gigantic corporations, which exclusively trim their budgets while your local paper or city magazine doubles or triples or quintuples its editorial budget, because they simply care more. 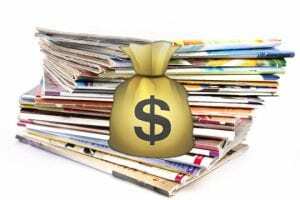 If only, back in the 20th century, Gannett—and Knight-Ridder, Hearst, Time Inc. and Times-Mirror—hadn’t rolled up so many independent publications and bundled them and securitized them like mortgage tranches and greedily demanded profit margins that sapped the lifeblood out of the publications, we wouldn’t be in this fix. It’s the greed of the public markets that acclimated owners to unsustainable margins. For the purpose of that righteous argument, all you have to do is pretend that the media business wasn’t a capitalist enterprise with obscene margins for three centuries before the first publisher went public. And that it didn’t enjoy those margins because barriers to entry were vast, and therefore competition was minimal and the value to all stakeholders—publisher, advertiser, audience—was roughly equal. And that it was a perfect economic ecosystem right up to the brink of the digital revolution. And that the revolution isn’t the point. Nor the demolished barriers to entry. Nor the glut of competition. Nor the crushing supply-demand imbalance. Nor the digital ad avoidance. Nor the bots. Nor the crooks. Nor the predatory duopolists. Nope, the problem is the profit motive. This from Robert Kuttner & Hildy Zenger in The American Prospect. Look, democracy is indeed at risk, and capitalism has plenty to answer for, not least over the unscrupulous relationship between Wall Street and politicians that is on the verge of fulfilling Marxist prophesy about the gross imbalance of wealth between the capital class and the proletariat. And, yes, such private equity scavengers, like Alden Capital, are certainly swooping in to feast on the carrion of the industry. They are indeed gutting what little survives of local and regional publishing. But they aren’t the problem—any more than the liquidators who will sell off Payless Shoes’ inventory down to the store fixtures are the problem with the retail business. They are simply the last manifestation of the life cycle. When the coroner is called to the scene of a discovered body, he or she never lists the cause of death as decomposition. If you wish to understand the fundamental problem of publishing, it’s that capital no longer buys you anything but the opportunity to lose money because there’s not enough revenue. And there is little hope that enough revenue will materialize to save the day. But we are so desperate about the damage, and so desperate to assign blame, that we simply default to our old suspicions, threadbare philosophies and historical villains. Here is someone most familiar with that phenomenon, and he kind of nails it. The author of that passage, of course, is Karl Marx. Journalist, critic, author and lecturer, Bob Garfield is co-host of WNYC’s Peabody Award-winning On the Media. His next book, in progress, is titled The Dumpty Manifesto.